What should you really be giving your baby at a certain age? It is important that your baby gets all the nourishment he needs for proper growth and development. 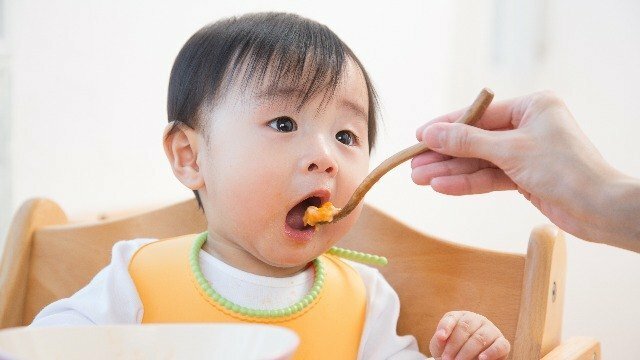 American Academy of Pediatrics (AAP) recommends starting solids at six months, when your baby has already developed physical skills that will allow his digestive system to take in simple solid food. He is curious about the food that you eat. One of the simplest signs that your baby is ready for solids is when he observes how you chew when you eat. He may open his mouth, too, when you offer him a spoonful. When you give your child some food, you know he's ready when he's able to move food from the front to the back of his mouth. He will also show hunger cues even after six to eight feedings. When your baby can hold his head steady and in an upright position, it's a simple sign he's ready for solid food. He can sit well if supported. Your baby needs to sit upright so he can properly swallow his food. It's best to do this in a high chair or feeding chair. He is steadily gaining weight. You know your little one is ready if he has already doubled his birth weight and is at least 13 pounds. You can start with pureed food with no added flavors. Experiment with foods that vary in taste and texture, but offer one ingredient for three to five days before moving on to another one. This will help you check your baby's allergic reaction to a certain food. Add a little amount of breastmilk or formula to make it a bit runny. Eventually, your baby will be able to eat with less liquid. Do one daily feeding when your baby is not tired or hungry, and move on to two to three feedings per day. Cerelac provides infants and toddlers the proper nutrition they need, specifically iron. A child needs five times more iron per kilogram of body weight than adults. Cerelac contains half of the daily iron needs of a child in one serving. Each bowl of Cerelac is a source of zinc, vitamins A, C, and B1. It also contains iodine and omega 3, and essential fatty acid, which the body transforms into DHA, which is essential to your baby's brain development. After mastering pureed food, your baby's maturing digestive system and growing number of teeth will prepare him for a greater variety of solids such as mashed food, followed by semi-solid food. However, avoid whole grapes, marshmallows, and white bread, because these are still too big for him to swallow. Instead, try scrambled eggs, well-cooked pasta, and finely chopped chicken. Make sure that whatever ingredient you choose for baby, it is well cooked and very easy to swallow. When feeding your baby, take it slow and be patient. He needs some time to get used to a certain food before picking his favorites. But do remember that solids are meant to complement breastmilk and not replace it. Milk is still the best source of nutrition until the end of the first two years.